There is an impact of rainy season in the month of savan. Moon is the owner of this month. Moon is also owner of Monday. Shiva controls every power of Moon. Lord Shiva removes the Moon related problems. 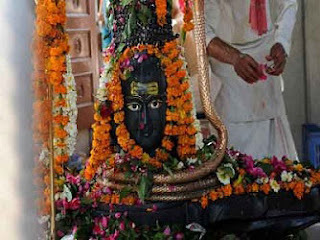 Worship of lord Shiva and Moon on Monday can solve every problem of Moon. Worship of lord Shiva and Moon on Monday night in savan month is extremely beneficial. Take bath and sit in front of lord Shiva. Offer belpatra similar to your age. Chant “Om Chandrashekharaye Namah” and “Om Shram Shrim Shrom Saha Chandramashaye Namah” with Rudraksha garland for 3 garlands. After that, worship lord Shiva to get rid of Moon related problems. Wear the garland through which you chant psalm or keep it with you. Start this remedy on any day at night in savan month. Sit in front of lord Shiva in evening. Offer bhang, dhatura and belpatra to him. Also, offer half silver Moon to lord Shiva. First, chant “Om Aashutoshay Namah”. Then chant moon’s psalm “Om Som Somaye Namah”. Cover half Moon in red thread after finishing the worship. Every day offer sandalwood on Shivaling in savan month. Donate white sweets or kheer to poor people. Wear silver stuff or pearl consulting an astrologer. Daily chant Moon’s psalm “Om Som Somaye Namah” for 108 times at night. Good Luck: Eat sweet products before going on journey. This makes journey happy and successful.